In this business, “quality time” usually is defined as a group scrum behind Gordon’s hauler or in the media center during a race weekend, or via NASCAR’s weekly national teleconference. Given Gordon’s crowded list of Hendrick Motorsports and sponsor-related duties, true one-on-one interviews have become rare. That’s why a day in the life of Sir Jeff, spent riding around in a Lincoln limousine during a promotional visit for Texas Motor Speedway, remains one of my favorite moments in journalism. Gordon’s visit in March 2006 was built around a tour of the Lockheed Martin Aeronautics Company, Air Force Plant No. 4, in Fort Worth. 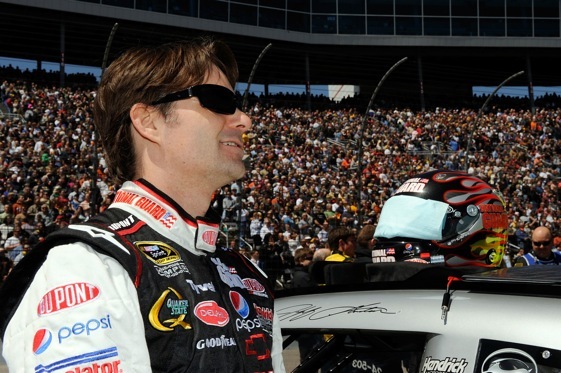 And before the six-hour junket filled with cell phone interviews, photo ops and autograph sessions was over, I watched Jeff Gordon bomb Las Vegas Motor Speedway. We’ll get to that anecdote in a moment. First, recall that Gordon created his last big race-day headline in the Sprint Cup Series on April 4, with a victory at TMS. That win snapped a pair of streaks that had seen Gordon go 0-for-16 at “The Great American Speedway” and a career-worst 47 races since his most recent Cup win. Never mind that Gordon, driver of the No. 24 DuPont/National Guard GED Chevrolet, now has been leading the Cup driver standings for five consecutive weeks. In these days of the 24/7 news cycle, race-winners rule…at least until the next qualifying session…and Gordon and crew chief Steve Letarte were seriously overdue. Through eight starts, Gordon leads Hendrick teammate Jimmie Johnson, the three-time/reigning Cup champion and race runnerup at TMS, by 85 points. At one point during his post-race news conference in Texas, Gordon was asked if he ever bought into the written and spoken suggestions that he can’t drive the Chevy Impala SS iteration of NASCAR’s Car of Today…specifically, that he can’t drive a loose race car anymore… that he can’t relate to the setups which have carried Johnson and crew chief Chad Knaus to three consecutive championships…that Jeff’s second marriage and new lifestyle as a daddy have softened him…that his championship mettle has been compromised. “I thought about it a couple of times,” said Gordon, 37, sixth on the all-time winner’s list but only one behind the legendary Cale Yarborough. “Never looked at it that way. And the facts are the facts. We had opportunities. We didn’t win, sometimes it was my fault. Sometimes there were other circumstances. And so it doesn’t surprise me that was written, and it’s OK. It’s our job as a team to come together and prove that wrong for ourselves, not for anybody else. Honestly, I think it inspired us to go through that. It made us angry, not because things were being written about it, because we know we’re better than that. Gordon also was asked if, as the losing streak grew legs, he sensed some of his detractors actually were beginning to root for him – thinking big-picture that when Jeff Gordon wins it’s good for the sport. Asked what he learned from the streak, Gordon said it was all about motivation. Now, back to that limo ride. In between those “live” cell phone interviews with various Texas sports radio personalities, myself and a fellow colleague got to question Gordon about his inability to win at TMS (he was 0-for-10 at the time), his post-divorce personal life, his growing interest in real estate (think Colorado) and his favorite street cars (with big ups for his Corvette Z06). Once inside the Lockheed Martin plant, Gordon was ushered into the cockpit of an F-16 Fighter – one awesome piece of machinery when you’re so close you can touch it. That was followed by additional seat time in the cockpit of an F-35 Joint Strike Fighter Jet simulator, where Gordon flew a “mission” in what was then Lockheed Martin’s newest project. The flight program chosen that day had Gordon darting up and over the mountains surrounding Las Vegas Motor Speedway. Once he got the hang of that, Gordon declared: “I want to bomb something.” The flight instructor dialed up a virtual image of LVMS, as seen from several thousand feet above the 1.5-mile layout and its grandstands. The original idea was for Gordon to strafe some buildings, including the garages and infield media center. Hmmm. But in one of those, ‘Hey, what’s-this-button-do?’ moments, Gordon launched a bomb attack that reduced the facility to smithereens. Memo to track-owner O. Bruton Smith: Consider it a case of your tax dollars at work. He exited the hall to a standing ovation, signing autographs all the way to the golf cart that carried him through the massive plant back to his limo. At Gordon’s insistence, that cart stopped several times to allow employees chasing after him perhaps their only chance to shake the hand of their driver, and get that No. 24 hat or die-cast or photo signed. Throughout the long day, Gordon was flawless. He was accommodating, articulate and amped – an ambassador for everything NASCAR is and wishes its image-shapers could be. Back in the limo, as another “live” radio interview was being cued-up from somewhere in Texas, Gordon offered a self-observation. Met Jeff Gordon at TMS when I was emcee for a Frito Lay event. He was great with the Frito Lay people and especially nice to me. I know I was just another face and name for him to deal with that day at one of many sponsor events. He was still very likeable and personable. John you hit the nail on the head when you said he is everything the NASCAR image shapers want for their sport. He is really a great example of what all sports and marketing people want their players or spokespeople to be.